Okay I know, I know. Multiple sections on a salad recipe?? That ain't right. You know what else ain't right? The fact that it's only Thursday today. Where are you weekend? Or how about the fact that it's still 10 more days to go until the CTFBC? Yes I'm counting..
Or that our little kitty has now started jumping onto our balcony's ledge? *shudder* Be still my beating heart. Do try this recipe though - it really is quite good for a casual weeknight meal. 1. Saute onion, garlic and ginger in oil until onion starts to soften. 2. Add curry, cumin, salt and tomatoes. Cook over medium heat until sauce thickens. 4. Cover and set aside to cool to room temperature. 1. Heat oil in a frying pan over medium heat. 3. Remove from heat and cool to room temperature. 1. Mix everything together, then set aside until assembling the salad. 1. Spoon salsa into individual serving plates. 2. 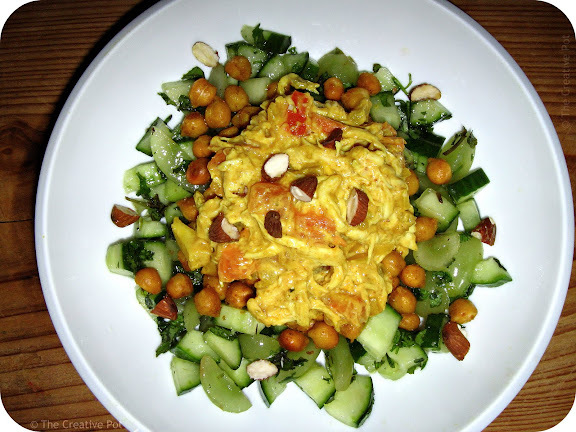 Top with a spoonful of chickpeas and a dollop of the chicken salad, then scatter with almonds and serve. I'm very jealous! How great is that convention going to be? Hope you have a good time. Sometimes you have to work hard for the good things in life. I think this is one of those times. Four parts? Not so bad. And looks delicious. Seriously. Where is Friday? can't come soon enough! wow! this looks so cool! I've been trying to psyche myself up to make risotto for years - a history in horribly burning rice is putting me off. But this looks good enough persuasion, consider me signed up! Yay for you, and well done on this challenge!